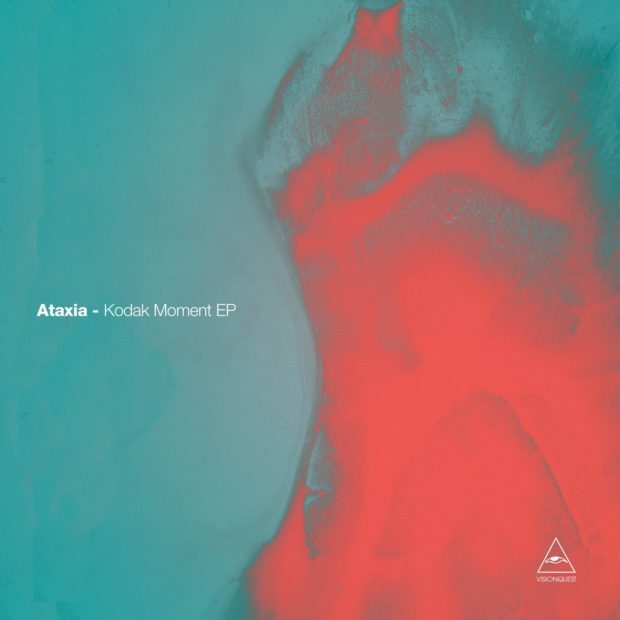 Detroit duo Ataxia offer up their ‘Kodak Moment’ EP via Visionquest this March, accompanied by an edit from label co-founders Shaun Reeves and Ryan Crosson. Eric Ricker and Ted Krisko aka Ataxia have been at the forefront of the contemporary house and techno scene for some time, racking up releases on some of the leading labels across the globe such as Leftroom, Nervous, Culprit and Play It Say It, making the duo one of Detroit’s finest exports in recent years. Here we see them making their debut on Visionquest, the label of fellow Detroit natives Ryan Crosson, Shaun Reeves and Lee Curtiss. ‘VHS’ leads the package with murky synth swells, resonant synth sweeps and fluttering square wave bass tones at it’s core as shuffled drums carry the ever-evolving hypnotic groove along. The original mix of ‘Kodak Moment’ follows, shifting the focus over to snaking bass lines, mind-bending, modulating synth whirrs and dynamic, choppy percussion throughout. Reeves & Crosson’s ‘Edit’ of ‘Kodak Moment’ then rounds out the release, stripping things back to ethereal atmospherics and shuffled drums whilst subtly stirring in the original’s hooky bass groove as the interpretation unfolds.